With a glass of cold white wine and some bread and salad, you’ve set up Saturday afternoon as a win. Another simple and successful Neil Perry dish. And yes, it is essentially pesto through no, it tastes nothing like the stuff in the jar. It is much lighter and fresher and really clean. A great Saturday lunch with a big glass of white. Using a mortar and pestle, pound the garlic and salt. Add the herbs and continue to pound until a thick paste is formed and the herbs broken down. Add half the pistachios and continue to pound until the paste is a creamy consistency. Chop the remaining pistachios and stir through the paste, also adding the parmesan, 2 tbsp oil and lemon juice. Season with more salt as necessary, and a pinch of pepper. Meanwhile, cook the spaghetti until al dente and set aside keeping warm. In a large pan, heat 1 tbsp of oil over a high heat and pan fry the prawns quickly; around two minutes. Sprinkle with a little salt. 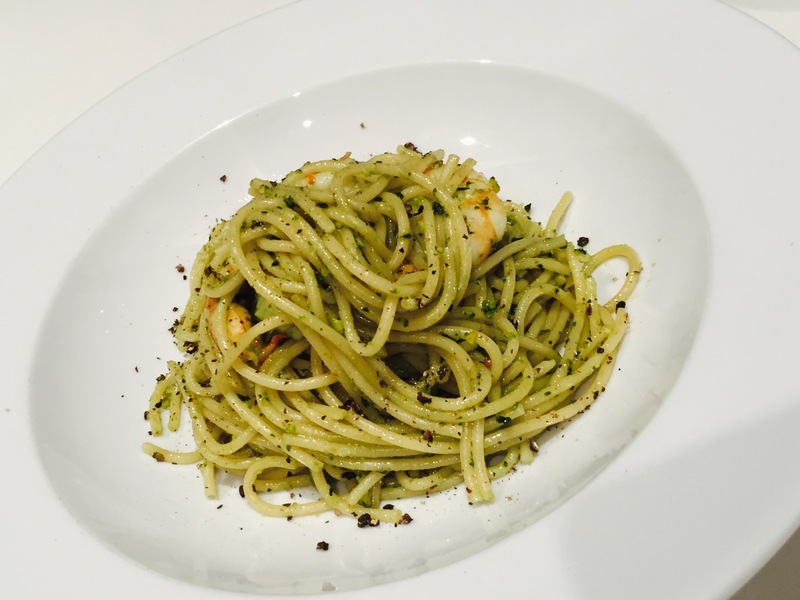 Mix the pesto with the pasta, stir in the prawns and serve.